One way to reduce my stash. 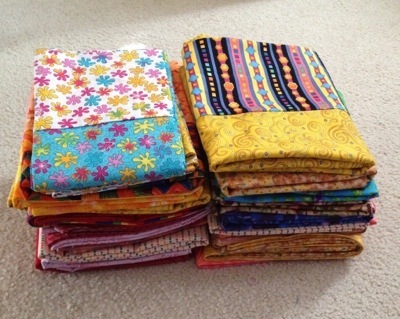 21 pillowcases ready to be delivered to SF QuiltWorks Collaborative. 24 yards of fabric gone from my stash. All those “what was I thinking” early purchases. Feels good. Two of the five Quick Strippie tops are finished. These were pretty mindless to put together but will make great donation quilts for kids. I love this sun fabric. Didn’t have enough of the barnyard fabric for it to be the focus fabric. I like how it turned out anyway. I finished the bricks top I started earlier this month. I’m not thrilled with that one dark green brick in the middle, but I’m not about to rip it out at this point. The topics made from 3.5″ x 6.5″ bricks cut from the Connecting Threads Hearth and Home line. It measures 48″ by 60″. A good donation size. The remaining bricks were tossed in the 3.5″ scrap drawer. Linking back to the May for Me progress posts. For Bonnie Hunter’s Easy Street Mystery Part 3, we are asked to make more (I’m still working on these units from Orca Bay 🙂 ) shaded four patches. While the method Bonnie uses works fine, I’m bored with sewing triangles on squares. So, I searched around on the web and found this method in Billie Lauder’s YouTube video and a couple of other places. Although, the instructions weren’t for the size we need. So I decided to experiment and I came up with this, which works perfectly for me. 1. Cut two 2” purple squares from the purple 2” strips as in Bonnie’s instructions. 2. Cut two 2 3/4” rectangles from the white/black 2” strips. 3. 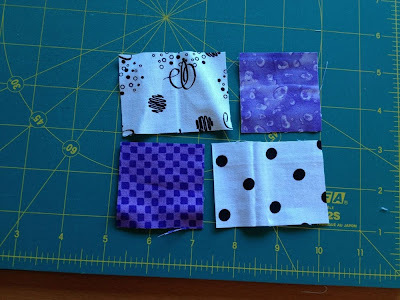 Sew each purple square to a white/black rectangle. Press the seams toward the right. Mine are finger pressed at this point. 4. 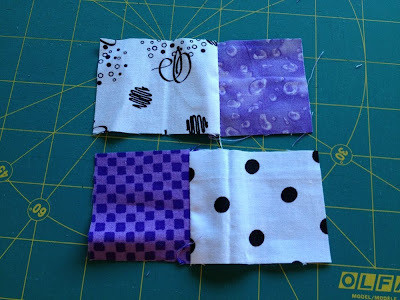 Sew the two rectangles together with the purple squares at opposite ends, just like a four patch. 5. Clip the seam allowance in the center so you can press the seams toward the white/black on both sides. Again, mine are just finger pressed. 6. Using the Easy Angle ruler or in my case, the Fons and Porter equivalent ruler, slice the finished unit in half diagonally as shown to get two perfect 3 1/2” triangles. 7. Sew two 3 1/2” triangles to the newly cut units as in Bonnie’s instructions to complete two 3 1/2” square unfinished units. And there you have it. Another way to make the shaded four patch unit. 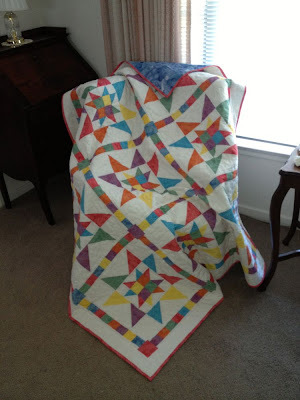 Update 12/10/2012: It was mentioned to me that this method was also shown in a book by Sally Schneider (Scrap Mania: More Quick Pieced Quilts). So, I’m happy to give credit where credit is due. Although I have no direct knowledge of Sally’s method or the book myself. Update 6/24/2014: Adding the additional step I’m using to complete the 3.5″ unit. Cut a 3.5″ x 4.25″ rectangle of the corner triangle color. Using the HST ruler of your choice and mentioned in step 6, draw the cut line on the Step 4 unit. Place the solid rectangle on top of step 4, right sides together. Sew 1/4″ on either side of the cut line. Then cut on the cut line. You should have two perfect 3.5″ shaded triangle units. Started adding more triangles to the HSTs for the Orca Bay border. These will be done as leaders and Enders for awhile. Added red inner and blue outer borders on the construction truck quilt. Pieced the pink and purple backing for Sloane’s Happy Child quilt. Also, today I realized I miscounted the number of four patches I need for Part 1 of Easy Street. I made 63 but I need 130 or so. 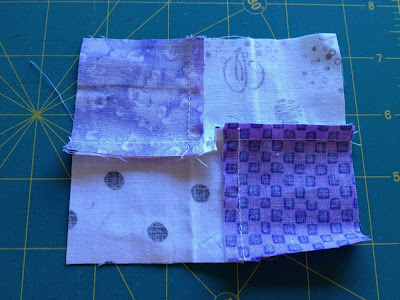 I’m afraid I will use up all the grey fabric on these and not have any for other parts of the quilt, so I think I will hold off making the additional four patches until more of the parts are revealed and I see where else the grey is used. In the meantime, I grabbed a grey top sheet that Mark wasn’t using for Darby’s bed and I will keep that in reserve if I need more grey. It matches the grey tone on tone I’m already using. 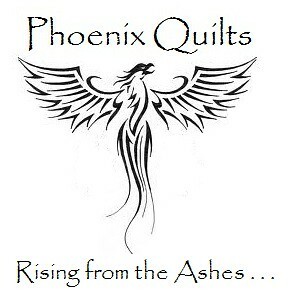 Before I get into my design wallfloor today, I have to tell you that I’m being featured today on Phoenix Quilts all because I donated a quilt to aid the Colorado wildfire victims. It was such a surprise to hear from Jen, who wrote the post on for Julie. Anyway, head on over to the blog to see the wonderful work that Julie is doing for all the wildfire victims. 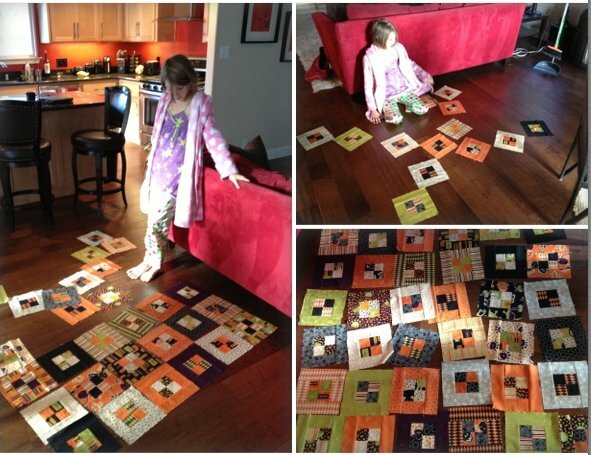 What started as a plea for quilts from just her area has turned into a wonderful charity. 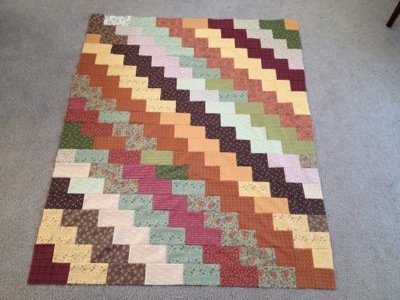 Judy, take a look and see which quilt I donated. Look familiar? Now on to what’s on my wallfloor today. I do actually have a design wall but it hasn’t changed since last week. 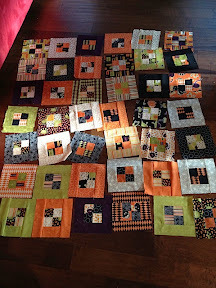 What did happen this weekend however, is that I completed the blocks for my Halloween quilt and turned my granddaughter loose with them on the floor. She is very picky about how colors go together so I thought she’d have fun with this one. And, she did. You can see her creative process at work in these photos. The pattern is Pandora’s Box from Jelly Roll Quilts by Pam and Nicky Lintott. And, I used a Jelly Roll of Monster Bash by Sandy Gervais for Moda. Definitely not my normal color palette but it was fun sewing the blocks together. 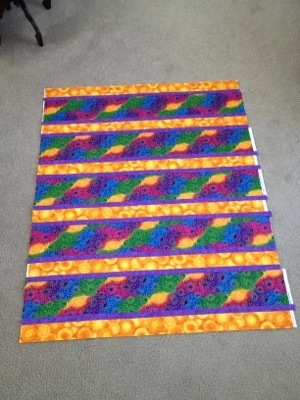 The pattern calls for 40 blocks for a 5 x 8 layout. 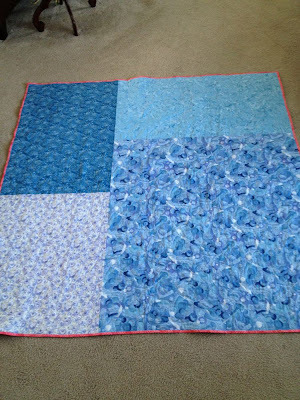 But that is too long and skinny for my liking , so I adjusted it and squeezed out 42 blocks for a 6 x 7 layout. I’m hoping to get the blocks put together this next week before heading out for Shipshewana on the 17th. I’ll probably use some black and orange from my stash for some simple borders. Haven’t thought that far ahead yet. 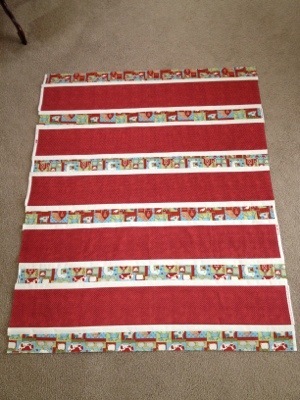 This is the first time a Jelly roll has been cut turned into blocks within a week of it’s arrival. Head on over to Judy’s blog to see what’s on other design walls this week. I’ve got a lot to show from this weekend. Saturday morning I jumped into my Farmer’s Wife Sampler with both feet. I had four blocks done from over a year ago. I pulled out my bin with the fabrics I had set aside for this and by 4:00 pm on Sunday I had 20 blocks done. I had so much fun with these. I was following Teri’s piecing instructions so they really were easy. I hope I’ll have time this week to do a few more. I’m traveling for business all week next week, so it might be awhile before I can get back to these. Click here to see what everyone else has been up to.